Yes, definitely sounds like the main stat. When the temp got higher i'm betting you were in slow moving traffic, or stationary. Then as soon as you speed up the temp drops again due to the stat being stuck open. Did the heaters work ok when the temp was 90+? How many bars is it supposed to show normally after warm? How do you access the hidden menu to see coolant temp? What is the right temp it should be when warm? KTMP is for the coolant temp. proper range is around 90 degrees Celsius, I wouldn't be worried if it's anywhere between 88-100 - It would move around a little due to driving conditions, but it shouldn't be far off this range. Last edited by Pistratoaie; 09-23-2014 at 09:02 PM. I got the opposite problem.. Unless you've got a diesel, which has an EGR thermostat (and some petrol 8 cylinder cars, I think), there aren't anymore thermostats. I would try changing the coolant temperature sensor (referred to as fan switch in some cases) it's cheap. Last edited by Pistratoaie; 09-24-2014 at 06:23 PM. 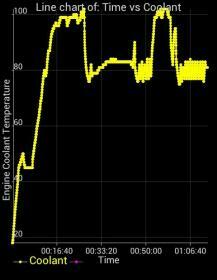 I logg ECU coolant via OBDII and app TorquePro. Yes its the engine oil cooler that Ive heard have thermostats. Its a bit disturbing that the BMW tech dont seems to know the heat management on this engine, it all started with fault code P0597 (thermostat bypass valve open) but it ran on quit good 95 degC, changed TS and it got "cold", changed again on complaints... same story still..cold. Do you have any more specification on the coolant temp sensor (fan switch), art nr, link? Thanks again I appreciate all help! See attachment! Engine Coolant driving on highway and city..between the "peaks, highway > 95 km/h" I stopped shortly and it heats up a little bit, then starting city driving gives the fluctuation 74-84 degC. I recorded (via phone camera) sensor reading on dash today to show the fluctuations to my mechanic on Monday. I'm getting relatively the same readings you are, except above 95k there's no change still. When I stop, it's usually stable at 92. Since you say changing thermostat twice didn't resolve the issue, I'm thinking I should hold off pushing my mechanic for doing replacement and look for the cause elsewhere, really need Monday to hurry up so I can get some news, hopefully! This is going in Monday as well. Last edited by Pistratoaie; 09-25-2014 at 07:01 AM. Reason: fan switch no.